If the UMass community only knew what they have hidden away in the old Hampden DC we’d have people clamoring at the door and while we’re on the subject; what is clamoring exactly? Surly the UMass Bakeshop (located in Hampden DC) is one of UMass’ best kept secrets. If you’ve ever eaten any type of baked item on campus, chances are it came from the UMass Bakeshop. 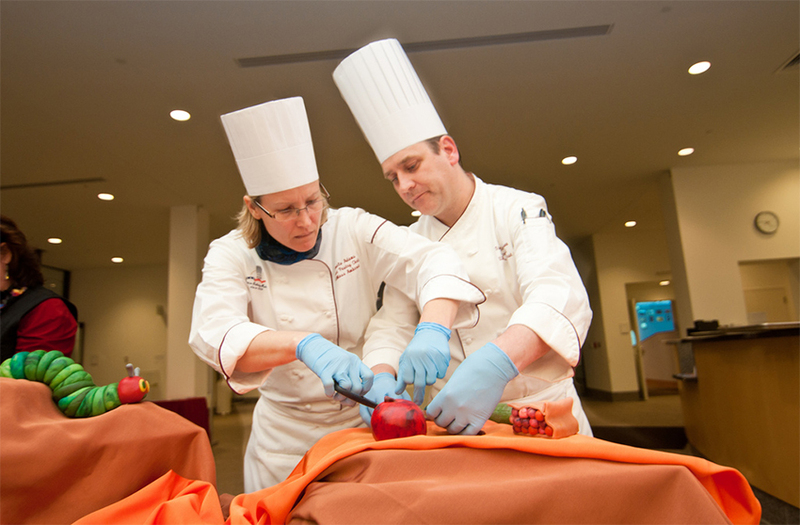 Baking for over 30000 people every day the UMass Bakeshop team boasts no fewer than four American Culinary Federation (ACF) Gold Medal winners. Let me put that into perspective. The ACF has been hosting hundreds of competitions every year for over 25 years. During that time it has only awarded a little over 700 gold medals. Four of these gold medal winners work at the UMass Bakeshop. There isn’t another university bakeshop in the country that can boast that level of talent! The amazing and talented collection of bakers and pastry chefs that inhabit the ground floor of Hampden DC prove themselves every day, with every item for every student. It’s a privilege to call them my colleagues. Now before you think I’m getting all misty eyed and gushy on you and I’m going to start blubbing like a character in a badly written romance novel let me tell you………………..I’m not getting over emotional. I’ve just got something in my eye, that’s all. It’s just flour dust. So quit staring ok.
Baking for that many people creates some pretty unique problems, not least of which is getting it all completed on time. Every item is baked fresh each day. We don’t bake for the freezer. Breakfast, baked fresh each morning leaves the Bakeshop by 6am. Lunch is completed by 9am and Dinner by 12pm. The bakers arrive at 9pm and work overnight with another crew arriving at 1am and more arriving at 3,4 and 5am. While many of you are safely tucked up in bed (well at least those of you that are not……………………studying for your next class………………….right…………………….. “no honestly Mom, I was up all night studying. Seriously, I don’t even know how those pictures got onto Facebook…”) a team of highly trained, dedicated individuals, is putting the finishing touches to your next meal. So next time you find yourself indulging in some fine pastries or desserts at one of the DC’s or retail outlets on campus give a little thought to those that brought it to you. The science experiment called baking (and don’t think I’m not going to get into that sometime soon) has been performed excellently by a group of dedicated and highly trained professionals that are truly committed to bringing you the very best. Now pass me the tissues and quit staring!